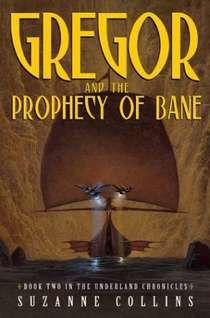 Gregor and the Prophecy of Bane was written by Suzanne Collins. It is book 2 of 5 in The Underland Chronicles. With more than capable narration by actor Paul Boehmer, Suzanne Collinss second novel in the Underland Chronicles series (Scholastic, 2004) practically vibrates with excitement and adventure. It takes a bit of time to catch up on characters and events from the first book, but enough hints are dropped along the way to make this accessible to new listeners. Gregor is an Overlander, an 11-year-old who lives in New York City. Boots, his toddler sister, disappears into the Underland, a vast world beneath the city thats populated by enormous bats, cockroaches, and rats, while sledding in Central Park. Gregor knows he must return to the strange underground kingdom of Regalia to rescue her. Boehmer gives each character a distinctive voice, and he has the tone and timing of toddler Boots down perfectly. His voice reflects the change in Gregor as he matures under the weight of his responsibilities. I will not spoil... but I love the little twist in this prophecy. Gregor needing to make a decision about what to do once he meets the Bane was definitely a moment that made you wonder what you might do in the same type of situation. Suzanne Collins definitely keeps it interesting.